You have certainly stitched some very lovely smalls. 12 Days is looking wonderful! Your Nan-a-thon year is coming along great. I do love your new scrapbook pages a lot, I have always admired this creative idea of yours. Now on to the next postcard. Wonderful stitching. The butterfly charm is very nice. Beautiful stitching, as usual. They are all pretty, but the 12 Days block is thecone that grabs my heart! I just love Just Nan ,all your stitching looks so beautiful. There is always lots of work and bead work in her designs but that's what makes them so beautiful. I really love how the water turned out on for Seven Swans! 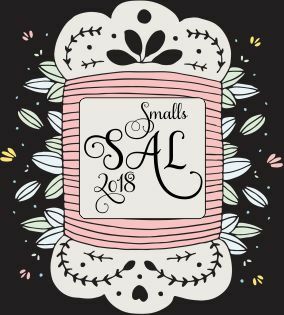 You had a great time with all your smalls this month, especially all the finish-finishings! So pretty, Jo! The pink filigree scrapbook finish is especially lovely and I love the Floral Sunshine which I have never seen before! Your 12 days is coming along, the swan is one of my favorites! Just love all of your finishes and ffo's. Look forward to the progress on Butterfly Bouquet. Oooh, I love your smalls! Such beautiful colours in Floral Sunshine and I love the scrapbook pieces. I'm glad you are still enjoying your Nan-a-thon. They look great! Love your scrap book pages too. Lovely cute finishes! Floral Sunshine has such nice, summer-y colours.